I was browsing through a used book store a few weeks ago, and I came across a little book in the section marked “Old books.” I had found one other older book in that section weeks before that, and I picked up Vagabonds House and leafed through it. I usually don’t read poetry and I had never heard of this author before, but the cover with a palm tree on an island setting interested me. I figured I couldn’t go wrong for three bucks, and even if I didn’t like the book, I could put it above my desk with other old books I’ve collected over the years. I got back to the house and once I started reading the book, I couldn’t put it down. The author was born in 1894 and died in 1957. Don Blanding was born in Kingfisher, Oklahoma and was a childhood friend of Lucille (Billie) Cassin, later known as the Hollywood movie star, Joan Crawford. In 1921, Blanding began writing poems that were published daily in the Honolulu Star Bulletin. The 1920’s was a time when a writer could actually make a living, writing poems for a daily newspaper. Blanding was also an artist and his poems featured his drawings. The book I picked up was the 51st printing of Vagabond’s House, published in 1928. It was a perfect day for reading this book in Arizona, as I sat at my desk and listened to the monsoon rain pounding down outside my window. The book is named after one of his poems where he describes his dream home, with comfortable furniture, books, food, drink, imported cigarettes, and room for friends to visit and relax. A perfect house on a far-away island. This book was written at a time when the world was a lot different than our busy world of today. There is a photograph of the author after the title page, showing Don Blanding walking on a wooden ramp, after exiting a sea plane. The photo shows him wearing a suit and several lei’s made of tropical flowers. The caption under the photo says, “Winged return to Paradise. The author arriving in Hawaii by Clipper from California.” There is no date with the caption, but I’m guessing it was sometime in the early 1930’s. As I re-read this book, I like to reflect on my travel experiences, as compared to the 1920’s that the author writes about. He doesn’t write about Hawaii exclusively, he covers Hollywood, women, food, names of ships, drifters, candle makers and other things and people from a time that now seems so long ago. This was a time when men and women dressed in suits and dresses to take trips on airplanes or ships. My first trip on a commercial airliner was in the 1960’s, as a U.S. Marine. Men wore suits, women wore dresses, and G.I.s traveled in uniform. There were no security checks at airports, and people smoked on airplanes, but those days are long gone. At least people don’t smoke on planes anymore. That part I don’t miss. Compare that to traveling today. I went to Cambodia last winter and saw people at the airport in Los Angeles wearing tank tops, shorts and flip flops. In Don Blanding’s Hawaii, I doubt if people dressed in that fashion outside their homes, and if they did, they were not flying on the Clipper from California with him. 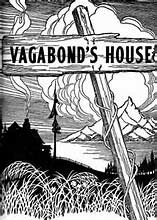 I was a kid in 1957 when Don Blanding died, and I’m at a point in my life where I really enjoy old movies and books from the 1930’s-1950’s, and there is nothing better in my opinion than finding treasures such as Vagabond’s House in used book stores. I like to read a few pages at a time, as I sit back and reflect on years gone by. I don’t wear a smoking jacket and an ascot, and I’m not sure people outside of the movies did that in the days Blanding was writing his poems, but it doesn’t hurt to daydream a little about exotic islands and a time before television and computers, when people actually read books. Don Blanding’s books are still available on-line, but the one’s I saw were expensive compared to his, “West of The Sunset,” advertised on the dust cover of this book for $5.00, in hard cover. That line gave me a lot to think about.